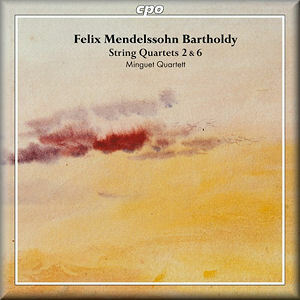 The Minguet Quartet combine precision with passion in this, the first volume of their Mendelssohn quartet cycle on CPO. The 2nd and 6th Quartets are given disciplined but dynamic performances, lively and engaging, and without any excesses of dynamics or rubato. The first movement of the 2nd Quartet provides an excellent demonstration of the many musical virtues ahead. The adagio introduction is atmospheric, without being overly slow, and the allegro that follows is given drive and energy by crisp articulation and the sheer precision of the ensemble and tuning. After hearing this recording and then going back to some of the great earlier accounts, from the Berg and the Ysaÿe Quartets for example, it becomes clear that the Minguet Quartet are presenting the music with the absolute minimum of distraction. The way they shape the phrases is understated yet always clearly defined. Their vibrato is almost imperceptible but contributes to the warmth of their tone. And their approach to climaxes and dramatic development sections is based on even pacing and precision, allowing them to give the music its full dramatic weight while never compromising the elegance of their tone for the sake of louder dynamics. The ensemble has a tight, homogeneous sound, a product of the recording perhaps as much as the playing. This means that when the melody is transferred to the viola or cello it is as if a smooth transition has been effected from the violin register down into the middle and bottom of the group. Lesser quartets might be at risk of sounding monotonous in this acoustic environment, but the Minguet players are never complacent about their textures and tone colours. Every movement and phrase is given a subtly different shading. Detail and pinpoint accuracy are not qualities usually associated with overtly Romantic readings, yet this recording manages both. Mendelssohn moves between dreamlike reveries and turbulent climaxes, and the Minguet players are fully committed to expressing these moods at both extremes. Tempos are occasionally faster than you might expect. That helps maintain the sense that the players are not abandoning themselves to the moment and are keeping everything within a tightly integrated structural framework. Some composers might suffer under that level of control in performance, but for Mendelssohn it seems ideal.